The world changes as if everything is in their palm, this is particularly true in the digital realm. And three of the top big names in smartphones have been spearheading the technological advancement with their respective new operating systems. With iOS 9, Windows phone 10 and Android M arrive on your phone at the same time, it is inevitably difficult for users to decide which is the best mobile operating system. So who wins the mobile OS comparison battle? Will the steady winner iOS still the king or do users prefer to put their money behind Windows Phone 10 or Android 6.0? To help users to decide which to choose, below we provide a detailed review on iOS 9.3.5 vs Windows Phone 10 vs Android 6.0 M.
Speaking of iOS 9.3.5, Android 6.0 and Windows Phone 10 comparison, we can't help comparing the inevitable hardware devices, among which an apparent difference is their internal memory capability. We take iOS 9.3.5 based iPhone 6s, Windows Phone 10 based Nokia Lumia 950 and Android 6.0 based Samsung Galaxy S7 for instance. Windows Nokia Lumia 950 ships with 32GB internal memory and 3GB RAM, supporting microSD, up to 256 GB; Galaxy S7 is armed with 32/64 GB, 4 GB RAM, providing up to 256 GB microSD card (single & dual two models); both Windows phone and Android phone make a great progress in internal memory to satisfy users larger needs. Yet, iPhone 6s still comes to us with 16/64/128GB options, 2GB RAM, no microSD card slot. Nary a mb space expanded. So, in this battle, it's obvious the Android 6.0 based mobile devices play the dominant roles and that iOS 9.3 based iPhone is cast into the shade. Certainly, you can purchase the 128GB iPhone for more files management. But the 16/32 GB iPhone users, you have no choice but to learn useful tips to save and free up iPhone space. Here comes one for you. The cutting-edge MacX MediaTrans is worth your attention if you don't try on an iPhone manager before. This iPhone manager app is well-designed to help you backup and transfer photos, music, videos and more files from iOS 9/10 iPhone iPad iPod to computer Windows 10/macOS Sierra so that you can remove the currently unneeded files and clean up space on your iOS space. A common concern of the iOS 9, Windows Phone 10 and Android 6.0 Marshmallow users is that what devices are those new mobile operating system compatible? It makes no sense if your phone does not support the coming OS. 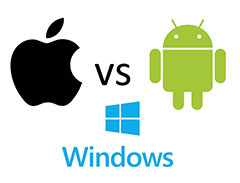 So which is the best mobile operating system that ship with most existing devices in the comparison of Apple iOS 9 vs Android 6.0 vs Windows Phone 10? According to the early test the Windows Phone OS 10 supporting devices, it is indicated that only a limited number of Lumia devices are compatible with the new mobile OS, like Lumia 630, 635, 636, 638, 730 and 830. More codes are said to be added to support a majority of Windows phones. It is said that Samsung Galaxy S6 and the Google's Nexus 2015 device will run the the new Android M 6.0. It's not clear whether Android M will support more devices or not, but in view of its predecessor Android Lollipop, also a variety of Android devices will run this OS. Apple iOS 9.3 was released on March 22nd, 2016 and is now available for iPhone 6S/6S Plus, iPad Pro/mini 4, iPod etc. Compared with iOS 9.3, Windows Phone 10 comes out earlier in 2015. As for Android 6.0, also called Android Marshmallow or Android M 6.0, the latest Android mobile OS is almost ready to meet the public, with Google expected to unveil the final version of the OS before the end of September, 2015. Whenever we make an mobile OS comparison, features are a key factor we should pay attention to. Will iOS which is famous for its outstanding features win the the comparison among iOS 9, Android 6.0 and Windows Phone 10 in this regard? Speaking of iOS 9 vs Android M 6.0, the latter also focuses largely on bug fixes. And also six areas will be the key points for the next Android operating system, including App Permissions, Web Experience, App Links, Mobile Payments, Fingerprint Support and Power & Charging. The Windows 10 for phones may come with the most changes as Microsoft is trying to introduce many apps. The mobile operating system gives the same experience you get on PC on a smartphone this time, allowing users to making and receiving phone calls on PC. So apps and features will look similar on your phone to on your desktop. A huge factor for users to decide the best mobile operating system among the mobile OS comparison 2015 is how long the OS can run. As the battery life of the previous iOS 8 is a nightmare, and tips on how to increase iOS 8 battery are frequently asked, in iOS 9, one additional hour of usage from iOS 8 and up to 3 additional hours when in the new Low Power Mode is added. Google has built in a basic saver in Android OS which allows users to see the battery usage broken down by app that feature will surely be seen on Android M 6.0. Windows Phone also has a battery saver option with an estimate of the remaining battery life. 5KPlayer - No.1 free iOS 9 video music streaming player to stream video music from iOS 9 iPad Pro, iPhone 6S/Plus to Mac/PC and also AirPlay media from Mac or Windows to Apple TV (4), AirPlay speaker. 100% clean & safe! Conclusion: the comparison above gives a rough look at the new mobile OS offered by the three giants in digital world. With all the three OS still on air, it may be too early to figure out which is the best mobile operating system and the winner of the 2015 mobile OS comparison is picked largely based on your own preference. But one thing is true, you are gonna have a better experience on the phone paired with iOS 9, Android M 6.0 or Windows Phone 10. As a common entertainment with mobile phones, to play both local and online HD videos movies on the phones. 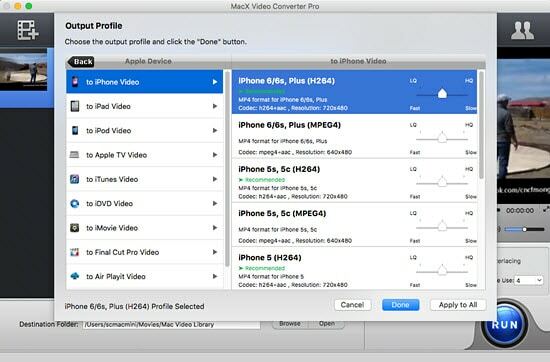 Considering the incompatibilities of the three mobile OS to play certain video formats (esp HD videos) and the inaccessibility to play online videos, the all-round video converter and downloader MacX Video Converter Pro will be what you need. See, it can easily download 4K UHD, HD and SD movies videos free from 300+ online videos sites, incl. YouTube, Facebook, Vevo, Vimeo. Plus, it helps to convert any videos to iOS 9, Windows 10 for phones, Android M -supported formats with 350 pre-set profiles, e.g., iPhone 6s/Plus, iPad Pro, iPad Air 2/Mini 4, Android, Samsung Galaxy Note 5/S7 edge and more with world's fastest speed and no quality loss.